I’m happy to report that our newest Lisette fabric collection has begun arriving on shelves at Jo-Ann stores across the United States. You can preview the whole collection in the fabric section of our website. This collection is a transitional one to help you move from summer into fall. The colors in the group are a bit softer and more muted, making them great for late-summer and early-fall. The collection includes an eclectic group of prints designed to coordinate nicely with each other and with the new season of Lisette sewing patterns which will be released later this month. As with our last collection, this one includes fabrics in a wide variety of fabrications. This season we have a delicate little two-color print in lawn that comes in three colorways. All three play nicely with the other larger-scale prints in the collection. The lightweight fabric is great for blouses and shirts. There are also a few lightweight canvas ikat stripes in the group which work well for a wide variety of purposes: skirts, pants, dresses, and jackets. This print can be dressed up or down, and the fabric is substantial but still drapey enough to be used in many ways. The twill bead stripes makes great skirts or jackets. The texture in the dots softens the print and gives it lots of versatility. The solid twill colors also included in the group help expand your sewing options. 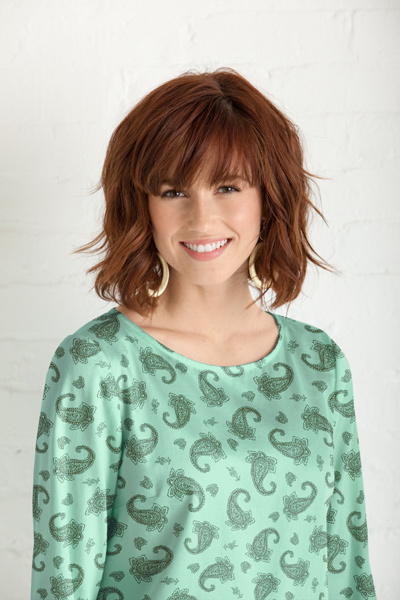 There is also an interesting block print-inspired paisley in a poplin which comes in two colorways. This fabric would be perfect for making a very cute late-summer dress or blouse, so pick yours up quickly and start sewing now! Both the ikat stripe in the canvas and the textured bead stripe in the twill will work well with one of the new Lisette sewing patterns that I designed specifically for stripes like these. I’ll have more on that soon as we near the patterns’ release date. In the meantime, pay a visit to your local Jo-Ann store to see the collection in person. Quantities for this collection are limited, so don’t delay. Lovely! I can’t wait to see the new fall patterns. What I see so far on the fabric website looks great; I am ready for some fall sewing! I’m so excited! I’ve seen two or three bolts at Joann’s already. The sateen has a lovely soft hand and beautiful drape. I can’t wait to see the lawn, since I really liked that from the spring. Also, the solids will most likely be quite useful, since it can be hard to find nice quality solids. The Lisette fabrics are on sale now, too! I was at Joann’s yesterday and bought some of each of the twill stripy dot fabric and the deep red sateen. All of it is beautiful and plays nicely with the sping fabric they stll had. I was a little sad that my store didn’t seem to have any of the lawn, but I still think I scored. I happened to be at Joann’s today and after reading the post about the new fabrics, I made sure to stop and look for them. I found just a few, I especially liked the red floral sateen. What I found puzzling though was that the sateen and at least one other fabric was on the bolt inside out with the wrong side showing! Love the new fabrics – i have to make a trip to joann’s this weekend to check them out. also, can’t wait for the new patterns! Eek! So excited to hear there will be a new season of Lisette patterns. I have loved the Spring range, it’s winter in Australia at the moment so I have been sewing furiously. That way I will have all my spring patterns made up for the upcoming warmer months.